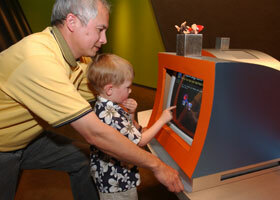 The original Kspace opened in conjunction with the National Museum of Australia in 2001. It closed on 26 June 2014 to make way for a new and exciting digital experience for kids. The original Kspace was inspired by the Museum’s vision of imagining the future, based on the idea that how we as a society imagined our future said a lot about how we viewed our present existence. Visitors used the Kspace computers to help build futuristic rockets and houses. The personalised designs were then presented as part of a space-age Australian city in a three-dimensional theatre. The original Kspace was created by the National Museum of Australia and the Australian National University Supercomputer Facility. The ANU team created the virtual city based on children’s drawings of an imagined city of the future. The four-minute film included a soundtrack by Australian electronic artists B(if)tek.